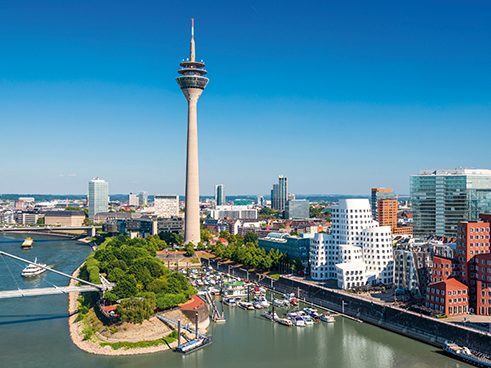 Situated on the banks of the Rhine, Düsseldorf is a major commercial center with 570,000 inhabitants. It is home to an important stock exchange and is a key trade fair location at the heart of Europe. Paris, London are Berlin are all just 550 kilometers away. This prosperous city boasts the headquarters of utilities, major retailers and telecommunication companies as well as key players in the electrical, steel and chemical industries. Düsseldorf is famous for its textile and fashion businesses. For years the city has enjoyed increasing fame as an innovative media hub and as a center of the marketing and advertising industry with a strong international standing. The excellent reputations of the Heinrich Heine University, the College of Music and the Art Academy attract young students from all over the world. 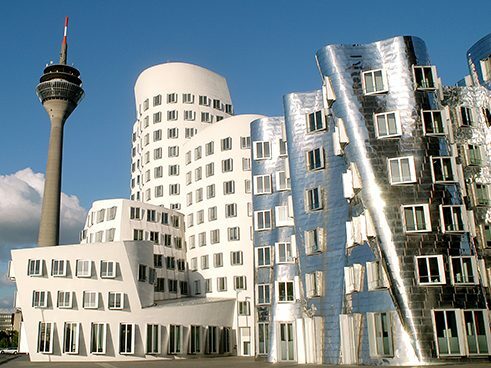 Düsseldorf is a major center of music, fashion and the arts. The collections of Düsseldorf's museums and galleries contain works from the great artists representing every conceivable period and style. Thanks to Joseph Beuys, the art academy is a world-famous platform for the avant garde. Since 1976 the Düsseldorfer Photoschule, headed by Bernd and Hilla Becher, has been producing Germany's most famous photographers, including Andreas Gursky, Thomas Ruff and Candida Höfer. 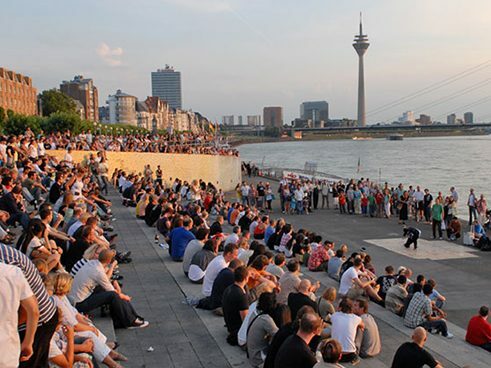 The Düsseldorf Tanztheater is regarded as a forum for the world's cultures. The rich program of opera, theater, concerts, small stages and festivals offers a wealth of educational and entertaining events for locals and visitors alike from every age group. Düsseldorf is also home to two literary museums: the Heinrich Heine Institute and the Goethe Museum. Where commerce thrives, people also expect to enjoy life's pleasures. There is always plenty to do when the working day is over, even after the throngs of Carnival revellers have withdrawn from the streets to wait for the next season: the Aquazoo, the Jazz Rallye, and the Japan Festival are just a small sample of the endless possibilities. The old city center enjoys the reputation as the place to meet and have a good time. Hundreds of cafés and bars and more than 200 restaurants vie for guests, from French gourmet spots to cozy, traditional beer taverns to a wealth of authentic ethnic dining experiences running the gamut from Korean to Arabian. Königsallee, or "Kö" for short, is among Europe's most exclusive shopping precincts. With 43 natural monuments and 11 conservation areas, Düsseldorf comes by its title as a garden city honestly. Among them is the Rheinpromenade, which is one of the most beautiful jogging routes in the entire Rhine region.